All brands of single-flue style chimney caps can be attached to the crown of a chimney with our cap mounting brackets. 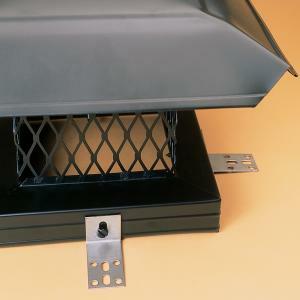 These stainless steel, 18-ga. brackets bolt to the base of your chimney cap using the cap mounting screws. They are prepunched for tapcon masonry fasteners. Simply attach a mounting bracket to each mounting crew and fasten to the chimney crown with tapcons.